To auction, buy or sell a David Hume autograph or a David Hume autograph letter signed, please contact NateDSanders.com at (310) 440-2982 or Nate@NateDSanders.com. Historically important David Hume autograph letter signed, discussing the contentious debate in Parliament on the Stamp Act, led by Prime Minister William Pitt who questions the moral authority to tax “free-born subjects without their consent”. Here, Hume writes to the Earl of Hertford, Ambassador to France, after witnessing Parliamentary debate in which Prime Minister William Pitt defends America’s opposition to the Stamp Act. Dated 27 February 1766 from Lisle Street, Leicester Fields, the letter reads in part, “…[T]he Parliament opened by a very extraordinary speech of Mr. Pit’s [William Pitt]. Besides asserting that England had no right to her Colonies, and that it was unconstitutional to take money from free-born subjects without their consent, he…much astonished his audience. He seemed even to treat the Parliament with contempt…and men were thrown into such wonder at the lofty and intrepid style of his discourse, that nobody had courage or presence enough of mind to answer him…Meanwhile the question which he had started, was brought on in the House of Peers; it was disputed, whether the English Parliament had a right to tax the colonies…Mr. Pit had carry’d the matter farther than almost anybody was inclined to follow him…It was moved by Mr. Grenville that the house should address his Majesty to inforce the laws in America. 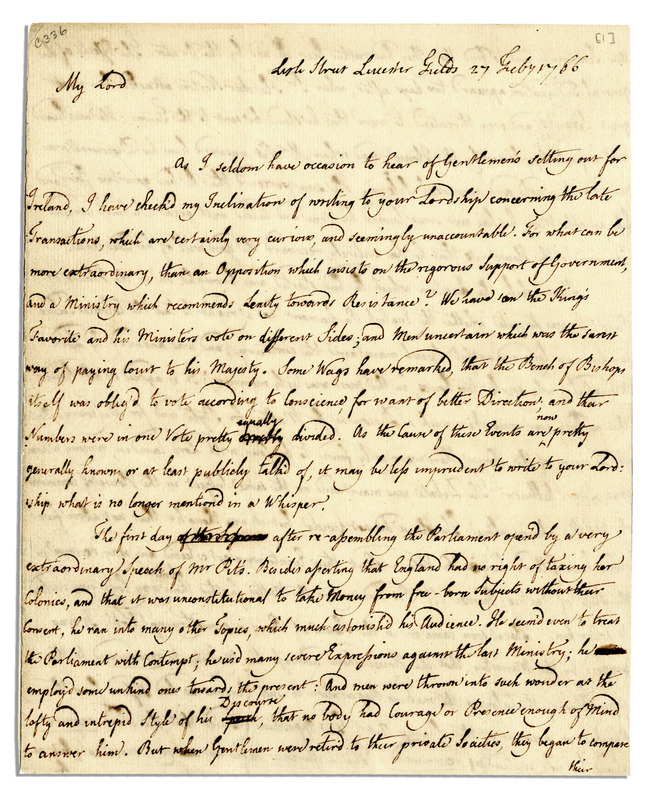 The…question was carried against him by a majority of 140; a number which surprised the Ministers themselves…Lord Rockingham published everywhere that the King had said to him that he was for the repeal of the Stamp Act…The King has since said, that this was a mistake…It was foreseen, that the countenance given the Americans by Mr. Pit and Lord Camden’s appearance for them would increase, if possible, their obstinacy. The bad effects on trade began already to be sensibly felt. Many manufacturers all over England had threatened to dismiss a half or two-thirds of their tradesmen, which must have produced infinite confusion…I am persuaded no one voted against the repeal but from party and in full hopes and confidence of being out-voted…” Hume, here serving on the staff of the British Embassy in Paris, also references the rumor that the lack of opposition to the repeal of the Stamp Act was partly due to Lord Bute’s having plotted to overthrow the Ministry. Letter runs six pages on two folded sheets. Measures 7.25″ x 9″. Reinforced along vertical folds, else near fine. This letter, found in “Letters of David Hume” has been called by William Knight, Hume’s biographer as “a long, minute, and singularly graphic account of the transactions of Parliament on its first day of its assembling that year.” Published in Grieg, “Letters of David Hume,” 2:18-23. Provenance: Sotheby’s John Young sale, 26 April 1869, lot 500; Alfred Morrison catalogue, 1897; Parke-Bernet sale, 26 November 1941, lot 269. Sold for $57,000.